The Ghost Orchid is one of our rarest and most sought-after wild orchids, and yet this diminutive plant grows only to around 30cm tall, is often much shorter, and nigh impossible to find due to its unpredictable appearance in the wild. It has no leaves and, devoid of chlorophyll (green pigmentation which enables plants to produce energy from sunlight), is entirely dependent upon a relationship with fungi in the soil around it for its survival. Each stalk carries between 1 - 8 flowers which are creamy-white except for the lip (labellum) which is white with intricate pink spots. Curiously the labellums are the uppermost part of the flowers giving them an overall appearance of hanging upsidedown. 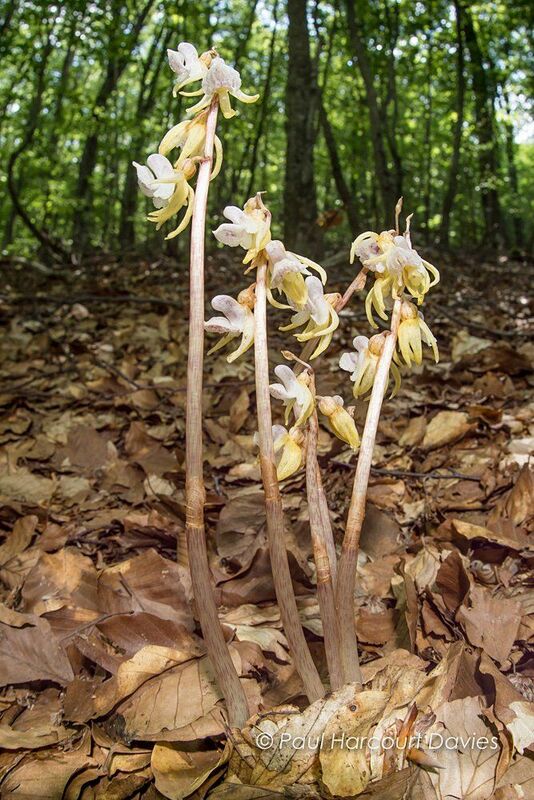 The Ghost Orchid spends most of its time underground and seldom flowers - up to ten year gaps are recorded in between the flowering of this elusive species. 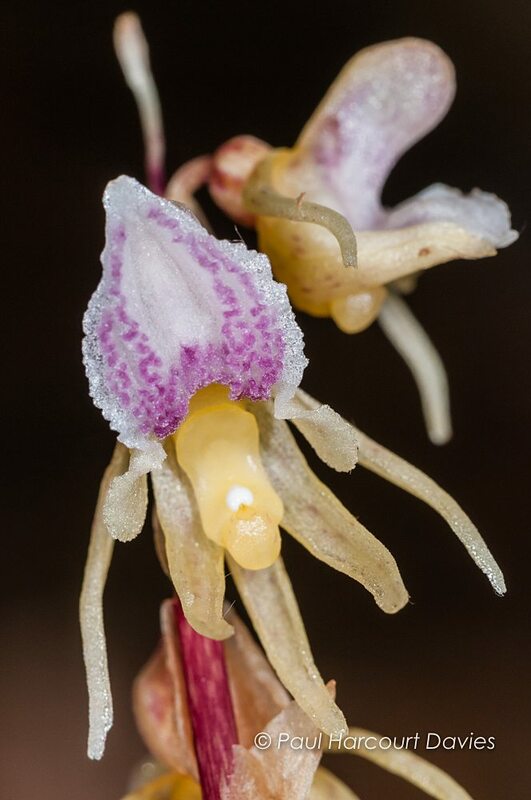 Above: A single flower of the ghost orchid revealing its rather delicate structure with crinkled (crenulate) lip which is delicately spotted with reddish tones. The two remaining petals and the three sepals are yellowish cream and point downwards. The large yellowish structure in the flower centre is the column where the pollinia (pollen bundles) reside. In the flower to the rear the large 'spur' is clearly visible at the top of the flower. Epipogium aphyllum is widespread throughout Europe but absent from the Mediterranean region. It is rare throughout its range. 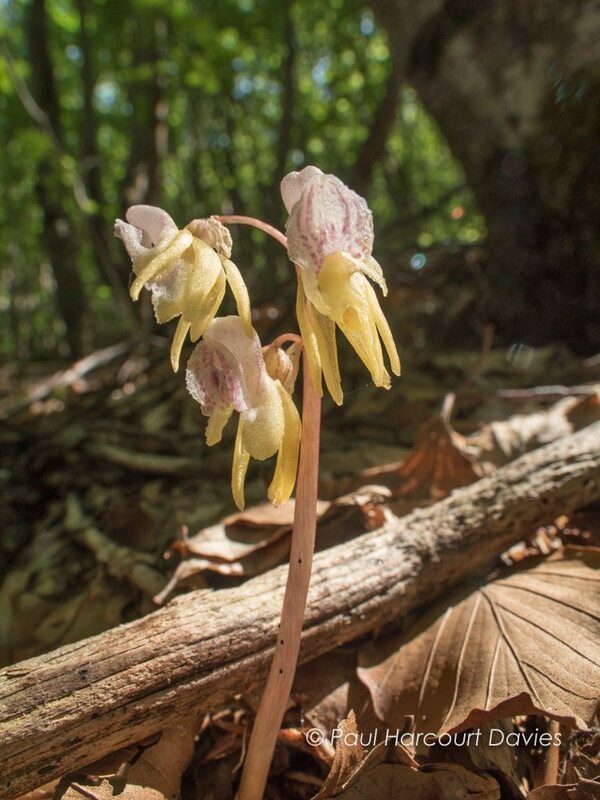 This orchid grows in deeply shaded upland woods, and appears through dense moist leaf litter. The plants on this page were photographed in various parts of mainland Europe.